Motto: "Iaşi must become the seat of science, the focus of Romanian intelligence"
Everyone, I think, knows that Iasi is Romania's cultural capital. This city, known for our great scholars Eminescu, Silberman, Xenopol, Blaga Kogalniceanu Toparceanu the city of scientific creation, cultural and spiritual, remain on the same cultural predestination. If you recognize this high title Iasi, the cultural capital, it is because here we find, most certainly great readers. More libraries and neighborhood invites reading. One might think that in this age of hi-tech site - Internet, television and discern the electronic book, the number of readers of classic books, printed, or traditional newspapers has decreased. Well do not illusions. Iasi remained in this regard, as the days of Eminescu, archaic and traditional. In Iasi people read in any weather, wind, rain, storm, blizzard. 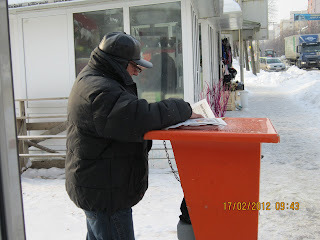 Even at temperatures of-120C, ieşenii read the press. This proves the man in the image. These photos should become the poster, not all the news, but for all libraries. And of course, the person in the image should be included in the Guinness Book of Records. Cine l-a ucis pe actor? Băsescu şi Boc daţi-ne ţara înapoi! © 2011 Copyright © Vasile Anton. Toate drepturile rezervate. - Drepturile de autor asupra. Tema Fereastră de fotografii. Un produs Blogger.